Ellen and Ryan, yours was a sweet and oh-so-complete day. Everything just flowed. Even the light rain showers at Shelter Gardens gave us all a chance to cool off a bit with umbrellas at the ready. It's hard to believe that you and your wedding party had the gardens, Boone Tavern, the courthouse columns and all of 8th St. to yourselves (that's a college town a week after graduation for ya)! Hey, speaking of graduation...congrats, Ellen, on completing medical school & best of luck as you both head to Oklahoma for residency (Ellen) & med school (Ryan). How have you managed to graduate, get married, enjoy a honeymoon, move & begin your next educational stage in ONE month?! Amazing. 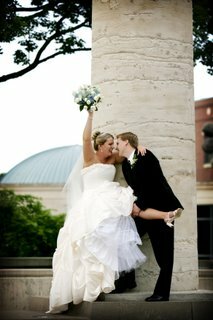 TAKE A LOOK at Ellen & Ryan's ALBUM!